The beautiful Cala san Vicente beach in Ibiza - Ball pages, folklore dance Ibiza. Cala san Vicente that belongs to the municipal de San Joan de Labritja is situated in the north east of the island Ibiza and approx. 25 min. drive from Eivissa (Ibiza -town). Cala san Vicente is a quiet and child-friendly bay with a wide sandy Ibiza beach. The bay is well known to the Ibicencos (locals) for its good Ibiza restaurants. This Ibiza beach has curves of sand with clear shallow waters that are safe for children. There are palm trees on the small traffic-free promenade and beachside cafe seating overlook this interesting bay. The gently sloping surrounding pine clad hills around this Ibiza beach are good for adventure walks in this quiet part of the Island. Your Spanish villa is near this Ibiza beach. Take a look at this 360 degrees view of the Ibiza beach Cala san Vicente, but take in mind that the beach is a straight line and not round. Cala san Vicente filmed from the bay/sea towards this Ibiza beach. 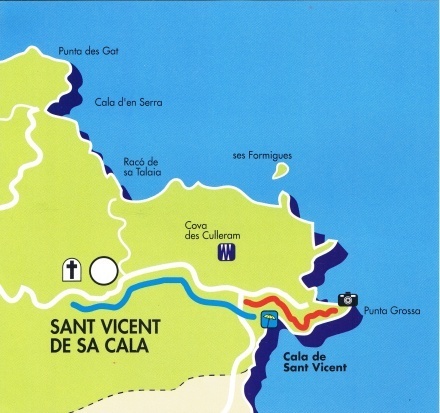 San Vicente in Ibiza, encompassed some of the island's oldest history, Cova d'es Cuieram. An extraordinary cave, high above the village testifies to a local population in very ancient times. The road leading in from the south offers fabulous views of the whole bay and this Ibiza beach, it is a favorite place for holiday snaps. Activities: Zodiac rentals, windsurf school, banana boat, Ibiza diving club. Size of this Ibiza beach: 380 meters long, 30 meters wide. Reached by car or bus, well sign posted. This is what the Cala san Vicente beach of Ibiza, looks like at the present. 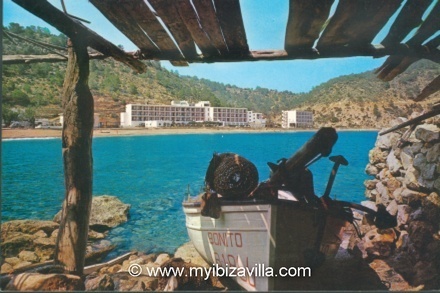 This is what the Cala san Vicente beach of Ibiza, looked like in the past. 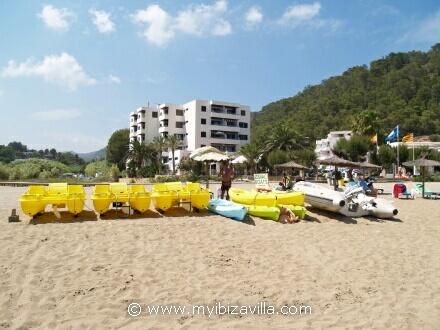 On the right side of the Ibiza beach "Cala san Vicente", among the collection of yellow pedalo boats, you will find "Juan" (the Ibicenco with the large moustache) who sits under an umbrella by his rental boats. 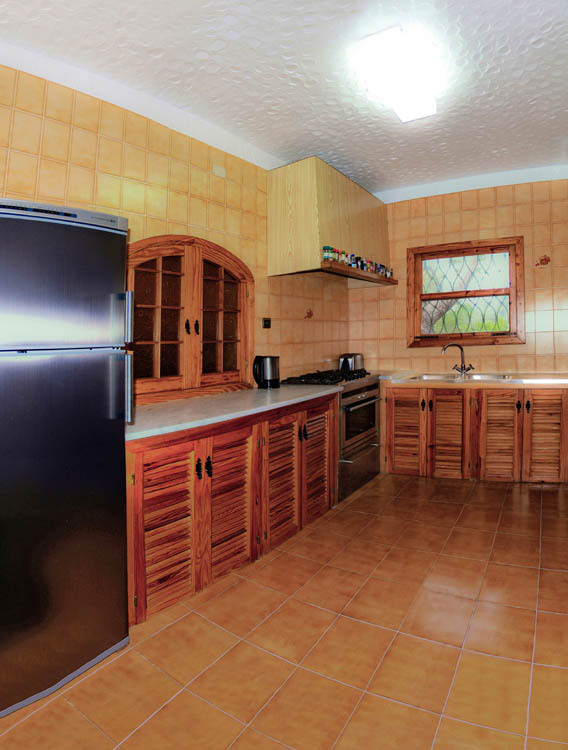 PLease note, Juan's Ibiza boat rentals are only available from 15 May till 15 October. VAT, petrol for the motor boats and life jackets are provided for every person. If you tell Juan that you found his info on this page, he will offer you a special discount. Cala san Vicent, walks and excursion routes. It's a short route of 4.5 kms, though very hard, especially for cyclists, owing to the steep inclines. The view is extraordinary in all directions, ideal for photographers. At the lighthouse of Punta Grossa, with a little luck, you can see the marine bird wildlife. 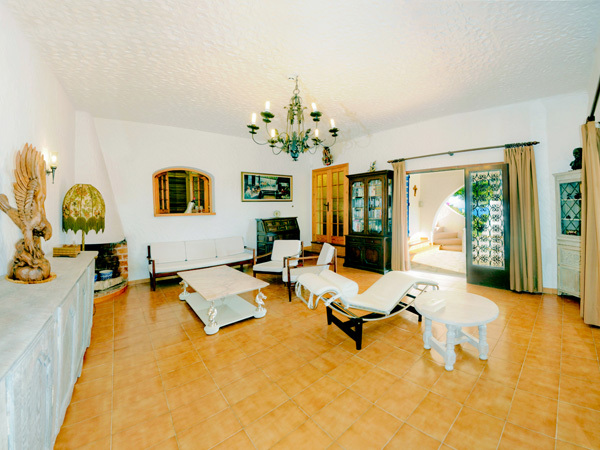 This consists a traditional farm track which connects La Cala de Sant Vicent with the village of the same name. Along the route, which crosses the edge of the mountain torrent, you can see the typical rural countryside with its houses, trees, dry stone walls, dry crops, etc., also the interesting vegetation peculiar to the Ibicencan torrents amongst which the Oleander (Baladre, Nerium oleander) stands out for its beauty. On arrival at Sant Vicent, the nineteenth century church is seen to be quite outstanding, as are the many typical houses and the rural countryside in general. The tiny hamlet of Sant Vicent shows how the agricultural society in Ibiza was organized; it is composed of scattered farmhouses whose meeting place was in the church or some house normally dedicated to trade. As for the church of Sant Vicent, one of the last constructed in the Ibicencan countryside in peacetime, its structure is far removed from the defensive function which characterises the majority of the rural churches built around the sixteenth century. The emblem of these routes, the "Eleonora's Falcon" is an exceptional bird of which there are only 6000 pairs in the world which all breed in the Mediterranean, Canary Islands, and the North West coast of Africa. In November they all emigrate to Madagascar for the winter. In Ibiza, they breed especially on the islands of es Vedra and Tagomago. These festivities in Cala san Vicente begin in the morning of the Patron Saint's day when the church rings the bell to announce that the fiesta is starting. Afterwards, there is a solemn Mass attended by most of the inhabitants of the village and many visitors. There is also a procession after the Mass. The tradition is that after this procession, there are typical folklore dances "Ball Pages" on the church square of San Vicente. On these traditional dances of Ibiza "ball Pages", you can see how the dancers are dressed up in the typical Ibizencan clothing. These "ballades" are organized by the local folklore group. Also, the public can enjoy tasting "orelletes" and "bunyols" which are typical Ibizencan delicacies, accompanied by wine or soft drinks. The afternoon is full of other activities : like recreational games, children's entertainments and dancing. The grand finale of this Patron Saint's Day is a firework show. The program of fiestas does not only center on the Patron Saint's day as there are many different activities e.g. musicals, exhibitions, cultural events, lectures, sports, competitions, etc. all of which generally take place the week before and the week after the Patron Saint's day. The whole point of these activities is to ensure that any resident or tourist can enjoy themselves whatever their interests or preferences are. The Saturday after the day of 8th August, the celebration of Saint Ciriaco. BALLADES AT WELLS AND SPRINGS/ FOUNTAINS The "ballades" (typical folk dance Ibiza) at wells and springs are carried out in the summer and honour the end of the harvesting and the work in the fields. Also they celebrate at "wells and springs" to worship the water. 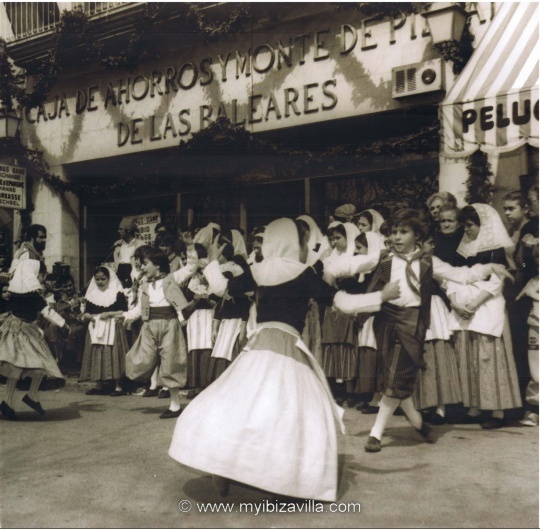 Thanks to the "colles de ball pages" (the folklore groups), these folklore dances of Ibiza have been rediscovered after many years and have been revitalized and set to music and dance. The celebration of this festival is carried out on the 15th of August in Cala san Vicente, an Ibiza beach, and several ceremonies are included in the program. You can also see then the traditional dance Ibiza "Ball Pages" where the dancers are dressed up in the typical Ibizencan attire. Ball Pages is the traditional folklore dance of Ibiza. The Ibiza culture and folklore dance that has lasted until now is made up of a mixture of the customs of the different people who lived in the villages of the area in the past. Ibicenco dancing took place in the church square, next to the communal wells or on the thrashing circle once the farming tasks had been finished. The traditional dances of Ibiza (sa llarga y sa curta) is a courtship dance and are of a flirtatious nature between men and women, in which the women form a circle, whilst the men outside the circle show off their masculine skills, making giant leaps and high kicks in the air whilst playing giant castanets. The dance would be initiated by the host and the older people, dancing "sa curta", of gentle rhythm and moves, which would be followed by sa "Ilarga", of faster rhythm and sharp movements. The attitude of men and women is very different during the dances: she, with short steps, lowered eyes and inscrutable manner, appears to glide, drawing circles within which the man dances, with vigorous jumps and gestures as he plays the "castanyoles", trying not to turn his back on the woman. The party ends with two nuptial dances, "sa filera" and "ses nou rodades", danced by the couple, and joined into at the end by all the guests to the rhythm of "sa Ilarga". The Balearic peasant women show off their headscarves, shawls and aprons embroidered with a thousand flowers, and also their precious jewellery, passes down from generation to generation, made of gold brooches, gold necklaces, and gold chains worn on their bosoms: the " emprendada" which is formed by several gold chains together with the cross and the "joia" which is also made of gold. As for the costumes, the oldest one is the "gonella negra", an outfit from the XVIII century made out of black wool and adorned with a silver and coral brooch, while the man wears a suit of the same material with silver buttons hanging from the waistcoat as well as the jacket. As time went by new varieties appeared, such as the "drap" or the "camisola". The "gonella blanca" is from the XIX century, and has pretty much the same pieces as the black one, although materials used vary. In this case, the large white cotton skirt stands out, given volume by the layers of petticoats worn underneath it by the woman, who is also adorned with a brooch, but on the sleeves and engagement rings: up to 24 of them, depending on the wealth of the bridegroom. After the white outfit, came coloured ones in the 19th and 20th centuries, as cotton gave way to other materials which could by then be acquired on the island, making female outfit more colourful. Both men and women would wear "espardenyes" on their feet, handmade from esparto grass and pita fiber. The difference between them is that men's shoes are open toed while women's are closed. A local festivity cannot be without music. The music is interpreted with local instruments all wind or percussion and handmade with materials that were easily accessible for the Ibicencan farmer. The flute is made of an oleander branch. The small drum is made of pine and rabbit or sheepskins. And the big castanets are made of juniper roots that are engraved by branding. The "ball pages", the typical local folk dance Ibiza, starts with the music of these instruments. You can see these brilliant typical outfits and ancestral dances in the popular fiestas which are celebrated in Cala san Vicente, Ibiza beach. In many of these festivities, where the inherited traditions are proudly kept up, the people organize the typical local folk dances and dress up with the traditional costumes for the occasion. Those in charge of preserving these dances and costumes are called "colles" or folklore groups and in Cala san Vicente, Ibiza beach, you can find their representative in the "colla de Labritja" or the "colla de Balanzat". One of the many groups on the island that keeps the tradition alive is the "Grup Folklèric Sant Jordi de Salines", created in 1982 by the Parents' Association of the Sant Jordi school, nowadays counting 45 members. Its main aim is to teach and promote Ibicencan folklore and it has many students starting from the age of four years. These aims of teaching and preserving the local culture are what motivate the members of the group to continue working, now that they are an association separate from the school, teaching the dances and the music to all those interested. The group promotes this culture all around Spain, taking part in exchanges with many other groups and performing at folk festivals and gatherings. 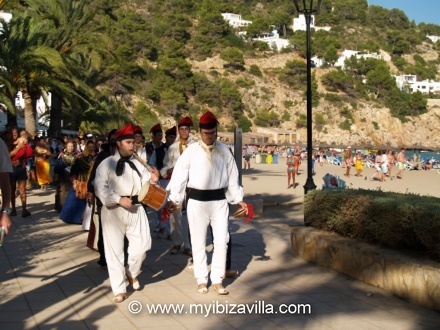 Traditional folklore dance of Ibiza, "Ball pages", in Cala san Vicente.